Investors who purchase homes in online auctions are more likely to hang onto them as rental properties than buyers purchasing homes at live auction events, according to a nationwide survey by Auction.com. 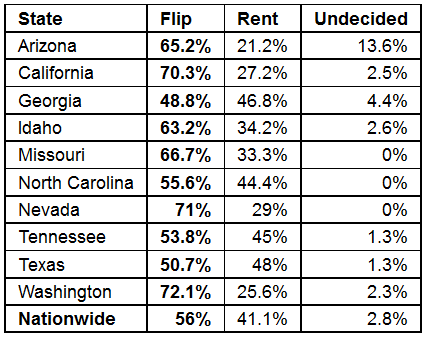 Most investors bidding at live events apparently intend to flip homes they purchase than rent them, with survey respondents indicating a preference toward flipping over “hold and rent” in every state where Auction.com conducted live events. Auction.com’s survey also showed that the more active investors were, the more likely they were to flip homes instead of holding on to them as income properties.